The new sequence, Global Society, will discuss social science research in the context of contemporary issues. In addition to adding a new sequence, the changes will expand Social Science Inquiry to include multiple tracks. “There is this sense that the Core [Curriculum] is the Core, and cannot change,” Jenny Trinitapoli, associate professor of sociology and director of the Center for International Social Science Research, told The Maroon. But Trinitapoli and her colleagues in the Social Sciences Collegiate Division believe the Core can evolve—and two major changes are in store for the Social Sciences Core, including a new course that Trinitapoli will be chairing. In the 2018–2019 College Catalog, released online in early April, the Social Sciences Collegiate Division revealed two major additions to the Social Sciences Core. An entirely new course, Global Society, will be offered starting in the fall. Meanwhile, the existing course Social Science Inquiry (SSI) will be expanded into three distinct versions, each with a different focus. Elisabeth Clemens, sociology professor and master in the Social Sciences Collegiate Division, said that Global Society is the first new sequence since Democracy and Social Science—which is now SSI—was introduced in the 1990s. Trinitapoli said the idea for Global Society developed out of conversations over the past several years within her department. “[We were] trying to think about how we can expand our notions of what constitutes social theory, [to] think about problems in the world that we actually live in, ranging from migration crisis to climate change, and population sustainability,” she said. Global Society will focus on a different topic in each quarter of the sequence. The first quarter of the course will include readings on society from varied cultural traditions. The thinkers to be explored include philosophers Thomas More and Jean-Jacques Rousseau and feminist Raden Ayu Kartini. The second quarter will discuss population through demographic approaches both archaic and modern. A significant component of the class will focus on economist Thomas Malthus. In the final quarter, centered on social change, Global Society will discuss issues of global change and development. The quarter will culminate in a capstone project on a specific population and its connection to social change. Trinitapoli said she put together the course with sociology professor Andrew Abbott and assistant professor in sociology Kimberly Kay Hoang. They were supported by Clemens and associate professor in history James Sparrow. The College Curriculum Innovation Fund funded Global Society’s development. Clemens described the initiative to The Maroon as a University effort to support more innovative courses as undergraduate enrollment grows. Her department supported Global Society through this program, providing grants for a research assistant and text translation. Trinitapoli said Global Society’s development unofficially goes back nearly a decade; Abbott has been researching, writing about, and translating texts that will be used in the course for around eight years. Designing the sequence took around a year. Last quarter, Abbott piloted a version of the first quarter. Trinitapoli also emphasized that Global Society is also meant to help students build analytical skills, including standardization and precise comparisons across populations. 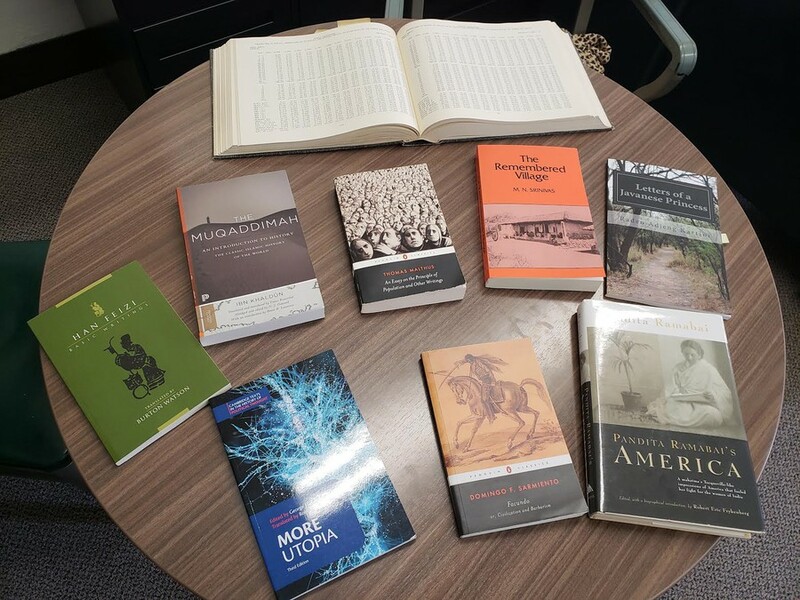 As an example of how the course will examine texts, Trinitapoli pointed to one example that will be used in the course: Pandita Ramabai’s America: Conditions of Life in the United States. Ramabai, a social reformer from India, visited the United States in 1886 and wrote an account of her observations. “It’s her ethnography of the United States; everything from gender relations to agricultural practices, from the perspective of an outsider,” Trinitapoli said. Representatives from UChicago United did not respond to multiple requests for comment. SSI will be offered in three versions starting in the fall: the existing version, as well as two new sections focusing specifically on formal theory and spatial analysis. Clemens said the intent behind SSI’s expansion is to clearly signal what skills will be taught in each sequence and to correlate the course with faculty expertise. The Formal Theory version of SSI will use mathematical and political approaches to examine societal interactions in which one person’s ideal actions depend on the actions of others. The course’s first quarter focuses on deductive reasoning and rational choice. The second focuses on elements of game theory, namely different forms of equilibrium—the state in a game at which no one wants to change their strategy. The final quarter focuses on games of incomplete information, as opposed to theoretical games in which all participants have complete knowledge about each other. The Spatial Analysis version of SSI will focus on how space, location, and related concepts help to answer social science questions. The first two quarters deal with spatial thinking and analysis. In spring quarter, the course concludes with a capstone project. Students will work on a research problem tied to space, using concepts learned throughout the course. Clemens said that the Social Sciences Collegiate Division is working to ensure that students are informed about the differences between the SSI sequences. She added that the Division has already spoken with academic advisors about the expansion. When asked if there are any plans to revisit and rethink any of the other Social Sciences Core classes beyond SSI, Clemens said that a review process occurs every year as each course’s staff plans syllabi. While not facing as significant a shift as SSI, the Self, Culture, and Society sequence is also facing changes to diversify its scope. The first quarter will now include Arab historiographer Ibn Khaldun. Meanwhile, the third quarter has been significantly altered. The quarter previously covered the social and historical conceptions of personhood; it will now focus on contemporary issues and how the social sciences approach topics such as feminism and environmentalism. Authors to be discussed include American physicist and philosopher Thomas Kuhn and Palestinian American literature professor Edward Said, a pioneer in postcolonial studies. An earlier version of this article misspelled sociology professor Andrew Abbott's last name.